A series of experiments at a novel outdoor laboratory could have scientists one step closer to measuring important attributes of rivers and streams from airborne instruments. Carl Legleiter, assistant professor with the University of Wyoming’s Department of Geography, specializes in remote sensing of rivers. His past work has focused on calculating river depth from spectral data collected by instruments carried by aircraft or satellites. He said the methods he’s helped to develop for estimating depth are close to becoming fully operational, which had him wondering what might be next. Moving on to estimating other stream attributes from the sky meant starting on the ground, in this case at the National Center for Earth-Surface Dynamics Outdoor StreamLab. The StreamLab features an engineered stream channel fed by water pumped from the Mississippi River that meanders across the property of the University of Minnesota’s St. Anthony Falls Laboratory. 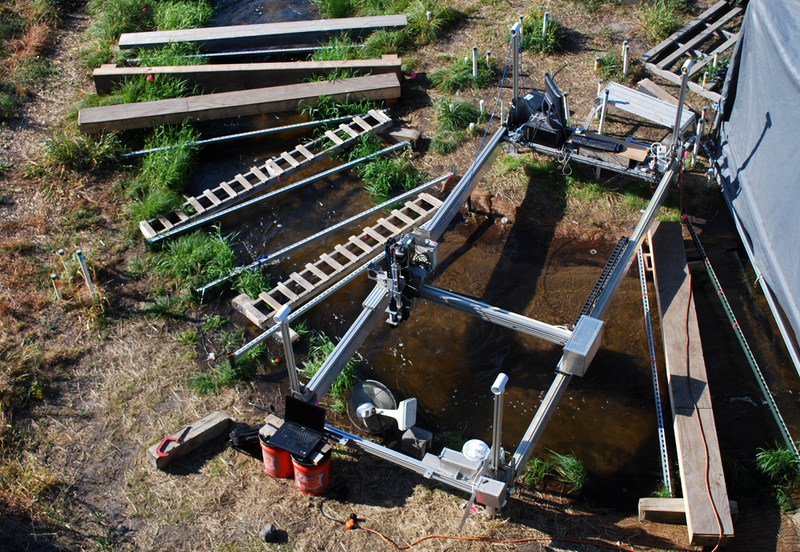 The Outdoor StreamLab was an ideal setting for the experiments, the results of which were recently published in the journal River Research and Applications. The facility allowed the researchers to manipulate some conditions that wouldn’t have been possible on a natural river. And the experiments were based on measurements of how the river reflected light energy coming from the sun, so working with an experimental flume indoors wouldn’t cut it. The researchers mounted their instruments to a mechanized cart that spanned the channel, allowing for precise positioning of the devices over the water surface. The instruments included a spectroradiometer for recording radiance, an ultrasonic profiler for high resolution measurements of water surface elevation, and an acoustic Doppler velocimeter for flow velocity. One experiment was an early step in determining whether the abundance of algae growing on the stream bed could be estimated by remote sensing. The researchers controlled algal abundance by placing ceramic tiles on the stream bed one at a time over the course of nine days. The longer a tile had been in the stream, the more algae it accumulated on its surface. Using the spectroradiometer, the researchers found that certain characteristics of the light reflecting off of the tiles corresponded with the differing amounts of algae that had colonized each tile. That’s an encouraging result that suggests this method could be scaled up to calculate algal abundance or map periphyton development through remotely sensed image data. Another practical application that could take advantage of algae’s strong spectral signal from the stream bed is the detection of stream sections where the bed has been recently disturbed, whether by sediment transport or a salmon digging around in the gravel to build a nest. That means the clean, fresh face of the upended rocks will give off a much different spectral signal than the rocks around it. “If you can identify places that have a larger proportion of the bed agitated like this, with some of the rocks turned over, we could use that to map salmon spawning locations,” he said. Legleiter will be working on a project attempting to do just that on a river in Oregon on this fall. That project attests to the value of their efforts at the Outdoor StreamLab, which were funded by the National Center for Earth-Surface Dynamics Visitor Program and the Office of Naval Research Littoral Geoscience and Optics Program.